In its recent report Global Honey Bee Colony Disorder and Other Threats to Insect Pollinators, the United Nations Environment Programme (UNEP) has brought together and analyzed the latest science on the emerging decline of honey bee colonies across many parts of the globe. It indicates that bees are early warning indicators of wider impacts on animal and plant life and that measures to boost pollinators could not only improve food security but also the fate of many other economically and environmentally-important plants and animals. The study underlines that multiple factors are at work linked with the way humans are rapidly changing the conditions and the ground rules that support life on Earth. Habitat degradation, parasites (e.g. 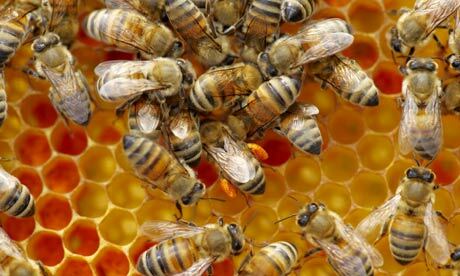 Varroa Destructor) and pests, air pollution, electromagnetic fields, herbicides, pesticides and insecticides (e.g. neonicotinoids such as Imidacloprid) all contribute to the decline of bee colonies. The managment of hives may also be adding to the problem. It is time to revalue the world and worth - economically and ecologically - of insects and other small organisms for the very existence of Earth and human life itself. Their importance for the environment and food supply is enormous. Farmers, industries, tourism should shift to a "Green Economy", a transition to a low carbon, resource-efficient economy. Part of that transition should include investing and re-investing in the world's natural ecosystem services, such as the often invisible, multitrillion dollar services of bees and other pollinators. Next year the nations of the world will gather again in Rio de Janeiro, 20 years after the Rio Earth Summit, to evolve international efforts to achieve sustainable development. Rio+20 will be a great opportunity to turn the tide. In the 1920s Rudolf Steiner, the philosopher and founder of the biodynamic method of agriculture, predicted that industrial agriculture would cause the extinction of the bee in the early 21st century. Let's hope otherwise.